A woman is forced to choose between her family and her most deeply held values. Nina Browning is living the good life after marrying into Nashville’s elite. Her husband’s tech business is booming, and her adored son, Finch, is bound for Princeton. Tom Volpe is a single dad working multiple jobs. His adored daughter, Lyla, attends Nashville’s most prestigious private high school on a scholarship. But amid the wealth and privilege, Lyla doesn’t always fit in. Then one devastating photo changes everything. Finch snaps a picture of Lyla passed out at a party, adds a provocative caption, and sends it to a few friends. The photo spreads like wildfire, and before long an already divided community is buzzing with scandal and assigning blame. 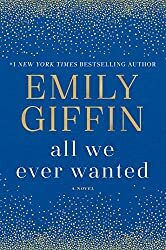 Emily Giffin is the bestselling American author of eight novels commonly categorized as "chick lit." More specifically, Giffin writes stories about relationships and the full array of emotions experienced within them. Giffin earned her undergraduate degree at Wake Forest University, where she also served as manager of the basketball team, the Demon Deacons. She then attended law school at the University of Virginia. After graduating in 1997, she moved to Manhattan and worked in the litigation department of Winston & Strawn. But Giffin soon determined to seriously pursue her writing. In 2001, she moved to London and began writing full time. Her first young adult novel, Lily Holding True, was rejected by eight publishers, but Giffin was undaunted. She began a new novel, then titled Rolling the Dice, which became the bestselling novel Something Borrowed. 2002 was a big year for Emily Giffin. She married, found an agent, and signed a two-book deal with St. Martin's Press. While doing revisions on Something Borrowed, she found the inspiration for a sequel, Something Blue. In 2003, Giffin and her husband left England for Atlanta, Georgia. A few months later, on New Year's Eve, she gave birth to identical twin boys, Edward and George. Something Borrowed was released spring 2004. It received unanimously positive reviews and made the extended New York Times bestsellers list. Something Blue followed in 2005, and in 2006, her third, Baby Proof, made its debut. No new hardcover accompanied the paperback release of in 2007. Instead, Giffin spent the year finishing her fourth novel and enlarging her family. Her daughter, Harriet, was born May 24, 2007. 1. Discuss the title, "All We Ever Wanted." How do you think it relates to the overall story? How does it apply to each of the characters in the book? 2. Both Nina and Kirk have very different ideas about what the "right path" is for Finch. How do you think each parent justifies their actions? 3. Tom is furious about the transgression against his daughter, and believes she deserves justice. How do Tom’s responsibilities as a parent come into conflict with the ethics of respecting Lyla’s wishes? 4. As the book progresses, Nina finds herself siding with Tom’s values rather thanher husband’s. Do you feel that Nina is betraying her family by aligning with Tom? Is she betraying herself if she does not stick to her beliefs? Whom does she owe her loyalty to more? 5. In chapter eleven, Melanie tells Nina that it’s a mother’s responsibility to stand by her child "no matter what." Do you agree with this assertion? 6. Why do you think Lyla is so willing to trust and even begin dating Finch? As you were reading, did you believe Finch’s claim that Polly stole his phone and took the picture of Lyla? If so, was there a point at which you began to doubt Finch? 7. Discuss the ways in which Tom’s and Nina’s pasts inform the way they live their lives in the present. Do you believe they were/are living their best lives? 8. This book poses the question of what lengths one should go to in order to protect one’s family versus preserve one’s values. What would you have done in Nina’s position? In Tom’s? 9. In the epilogue, Lyla tells Finch that Nina "saved" them both. What do you think she means? Do you believe this is an accurate statement? 10. If you could write subsequent chapters for this book, how do you imagine the relationship between Tom, Nina, Lyla, Finch, and Kirk playing out?